So we should probably start this post with something of a disclaimer: we bloody love the Pizza Pilgrims. If you are looking for a review that is going to take down the toast of pizzatown, you will be disappointed. Sure, our affection is tinged with a healthy dose of envy when it comes to the story of two brothers who decided to pack it all in and travel around Italy eating pizza for a bit, before casually returning to London to set up a successful street food business, open a pizzeria in Soho, launch a cookery book and open a second restaurant off Carnaby Street. All in just over two years. But luckily we at the LPB aren’t ones to hold a grudge, and you certainly don’t get on our good side by serving up a second-rate slice. Since it first opened we have enjoyed many a visit to the Pilgrims’ debut restaurant on Dean Street where you can bank on a top-class pizza and a seemingly inexhaustible supply of 80s and 90s hits. But when it came to the new Kingly Court site, the addition of deep fried pizza to the repertoire had us on unfamiliar territory. 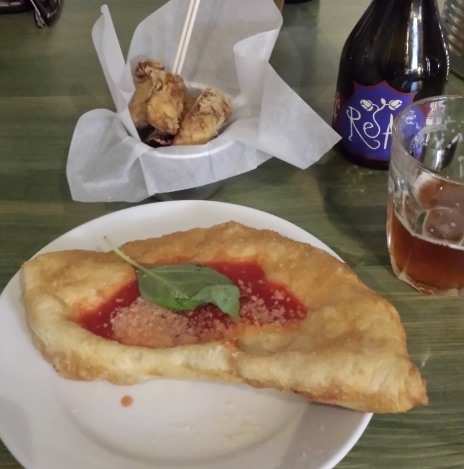 While it may sound like something you might find in a Glasgow kebab shop, the Pilgrims assure us that Pizza Fritta is an authentic and much-loved form of Neapolitan street food. And rather nice it is too. One of these miniature calzones serves as a good starter portion and we were surprised by how light it was, generally lacking in the stodgy greasiness we were anticipating. We went for the porchetta, ricotta, smoked mozzarella, parmesan and basil option, which was a nice creamy filling. The whole thing is topped with a dollop of tomato sauce, though we could have done with a bit more of it to get the full tanginess that comes with a traditional pizza base. Sticking with the theme, we also threw in some Carciofi Fritti, or deep fried artichoke hearts. Here they are served in a thin batter and seasoned with rosemary salt. The result is a tasty, moreish snack with flavours that seemed very Roman, but we might have just been imagining that. Then it was on to the main event. Generally we don’t customise our pizzas, preferring to sample them as the restaurant intended. However on this occasion we allowed ourselves a small indulgence and topped up a Napoli Salami pizza with ’nduja, the fiery Calabrian sausage paste we were introduced to by the Pilgrims back when they first started out. The salami is sprinkled liberally across the pizza in thick, juicy pieces and boasts more than enough flavour to hold its own as a lone accompaniment to a margarita base. Similarly the ’nduja is perfectly at home on its own, but we can’t get enough of it, and the signature pork-and-chilli kick it added was brilliant. We paired this powerful pizza with a more subtly-flavoured number that has made it, thanks to popular demand, from an occasional spot on the specials board to a permanent position on the menu proper: the Carbonara. 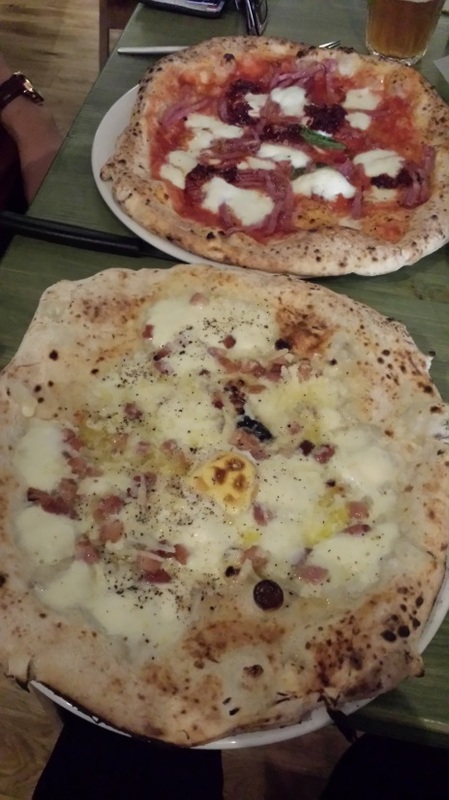 This is a bianca-based pizza inspired by the classic pasta dish of the same name and is topped with roasted pancetta, fior di latte, parmesan, pecorino, black pepper and, of course, an egg yolk. The combination of cheeses, along with the egg yolk, creates a rich and pleasantly salty flavour that is given an extra burst of intensity when you come across the pancetta. The Kingly Court site is a great addition to the Pizza Pilgrim’s rapidly-expanding empire, and while we still prefer the traditional pizza, we will certainly be back to sample their deep-fried cousins soon. 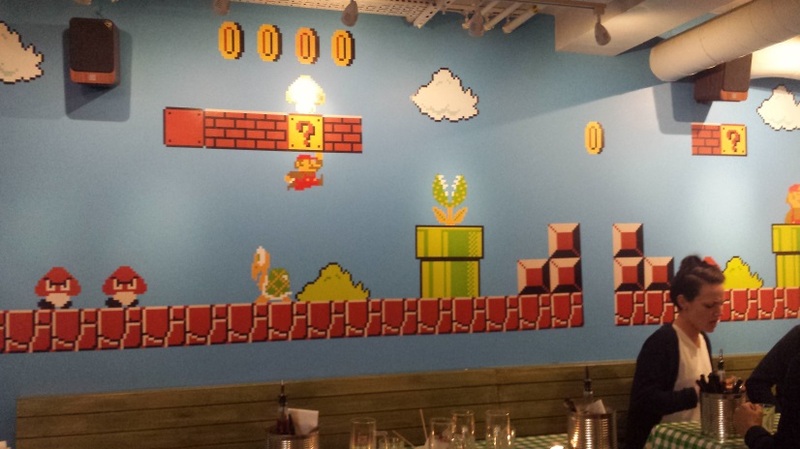 Oh, and they have a pretty cool Super Mario mural downstairs as well. I was looking forward to attending the opening night with a certain Dutchman….